It was named after an American bridge player – Sam Stayman. You might think from this that Mr Stayman invented the convention, but it appears that he didn’t. 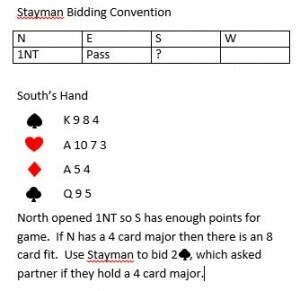 It seems that the convention was developed independently by two different bridge players one of whom, George Rapee, was Sam Stayman’s regular bridge partner. 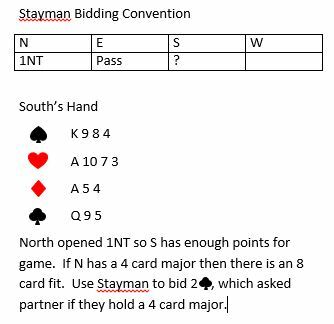 Sam wrote about this new bidding convention in an article for the June 1945 edition of The Bridge World magazine. Because Sam Stayman had written the article, the convention came to be known by his name – The Stayman Convention. « Duplicate Bridge Percentage Scoring	» What Do Playing Bridge And Attending A Computer Class Have In Common?